Get ready for some Munchkin, some magic, and probably also a mess: The weekend of August 24 will bring with it #PlayMunchkin Magical Mess events around the U.S. and Canada! 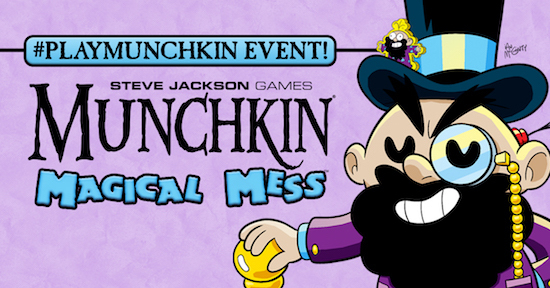 These events feature Munchkin Magical Mess, a core Munchkin game that's in the same vein as Moop's Monster Mashup. Magical Mess includes lots of animal puns – you can wield the Flamingun to fight the Panda Ray or Amoeba Earhart, for example! Each store signed up for the events will have tons of promo cards, including Mistakenly Modified Moop – which is the promo card featuring the mischievous magician Moop, who you'll see on some cards in this set. They'll also have a plush tentacle to use as a top prize or a door prize, and they'll have a demo copy of the game ready to play. Events may be on Friday, August 24; Saturday, August 25; or Sunday, August 26. Below you'll see a list of store names and locations. Follow the link to your local store, and give them a call for the specific date and time of their event.